Klimatyczna, niekościana gra kooperacyjna Cutthroat Caverns produkcji Smirk & Dagger z sukcesem zastąpi u Ciebie grę RPG. Jedna z niewielu tak immersyjnych gier na rynku, oferująca bardzo dobry balans rozgrywki zarówno przy elemencie kooperacyjnym, jak i mechanice zdrady. Nie współpracujecie, nie przetrwacie. Bez zdrady, nigdy nie wygrasz. Genre-bending. Dice-less. The totally immersive feel of a RPG in a simple, elegant card game. 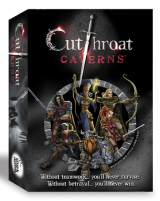 A perfect balance of cooperative gameplay and back-stabbing goodness. An artifact of untold power lies in your hands. To claim it, you must escape the caverns alive. No less than nine horrific beasts stand in your way – that, and the greed of the other players. In this game of kill-stealing, you decide whether to swing for a whopping 50 points of damage – or hold back, awaiting a more opportune time to strike. Only the final blow matters if you are to score the kill. Hold back or sabotage other’s plans too much – and the entire party will die, without a winner. Cutthroat Caverns is truly unique. While most definitely a highly interactive card game and very easy to play, it requires the strategic thinking of a board game. And, for some uncanny reason, the game will make you FEEL like you are in the middle of a classic dungeon crawl, even though table talk is about as much roleplaying as you are likely to do. That all said, it has proven to have a very broad appeal with gamers across several genres. The real joy is the delicate balance between helping the party (and staying alive) vs working towards your own selfish goals (and risking the welfare of everyone). There are no dice. Each Turn, you will choose how much damage you are willing to do to the monster- or won't do - as you jockey for position to land the killing blow. And when characters can make that kind of decision, things get very funny & very deadly - very quickly. With 25 encounters, all requiring a different group strategy and seperate individual strategy, game play is always challenging. Only 9 random encounters are used in any game, so the experience is always different. With fresh new mechanics built into each expansion and a creature pool now 75 strong - there is always a new adventure ahead. And they become deadlier as we go.